A trusting relationship requires each party be trustworthy and that each party be trusting. There is a difference between being trustworthy and being trusting. Be honest. Tell others how you feel, even if it is to not agree. Keep confidential information to yourself. Don’t gossip. Do what you say you’ll do. Follow through on commitments. When we say someone is trustworthy, they are doing these kinds of behaviors. When we say that someone is not trustworthy they are not doing these kinds of behaviors. A trustworthy person gets trust from others. When these behaviors are not followed, trust is damaged or lost. Admit when you do not know something. Be curious in the lack of knowledge. Take responsibility for your actions. Especially when it will cause you trouble. Share information freely, even personal information. Trusting behaviors are about being vulnerable, about taking a risk with the other person. The willingness to exhibit trusting behaviors is the result of the other person’s trustworthy behaviors. For some, a relationship starts with trusting behaviors. That is trust of the other comes quickly. This attitude might sound like, “I trust others until they prove otherwise”. For some, the relationship starts with the other person exhibiting trustworthy behaviors. That is, trust is only earned. This attitude might sound like, “They have to earn my trust.” It would be easy to imagine the advantages and disadvantages of these two approaches, especially if you are strongly in one of these two camps. Doing this exercise would only tell us that the best way to quickly achieve a trusting relationship is to be both fully trustworthy and be fully trusting from the get-go. Logically, that makes sense, but then why aren’t we both trusting and trustworthy right from the beginning of a relationship? What are the barriers to exhibiting trusting behaviors? Part of this answer might be deeper in the psychology and evolution of human brain than I am able to go. The lack of trust is a protective barrier. But at some point, someone in a group needs to take a risk and exhibit some trusting behavior. While we might simply say that a lack of trusting behaviors is “just how I am” or it’s “natural”, the lack of trust is often compounded by the workplace environment. We must remember, firstly, that we are not working in a life or death situation. Also, as a leader, you already have the power and control. There is little reason for a lack of trusting behavior, especially when you are the leader. What are the barriers to being trustworthy? I think that we all want to be perceived as one-hundred percent trustworthy, but we may not be perceived as such or we may be struggling with being one-hundred percent trustworthy. Some may even be willing to admit that they are purposefully less than trustworthy (and they are probably the most honest about it). Earlier I implied the trustworthy behaviors seemed straightforward and hard to argue against. If this is the case, then why would someone not clearly exhibit these behaviors? I believe that there may not as much difference between trustworthy and trusting as these previous descriptions may imply. If I am not willing to be admit that I am wrong, am I being honest? If I am not willing to apologize for a mistake, am I being consistent if I expect others to do so? If I am not sharing information freely, am I being fair? If we are not regularly giving direct feedback to a team member, might we be seen as speaking poorly? These examples might tell us why someone who is not trusting, may also be perceived as not trustworthy. We can seemingly justify not being trusting of others, but in doing so we may also justifying not being trustworthy. If someone is waiting for the other to exhibit trustworthy behaviors, perhaps the lack of trusting behaviors by the other is being perceived as a lack of being trustworthy. And it probably goes the same in reverse. If both parties are waiting for the other to be trustworthy, this relationship is bound to fail. I believe we all want to be and be perceived as being trustworthy, but in order to be perceived as trustworthy, one has to also exhibit trusting behaviors. If you are looking for a road map for building a trusting relationship, I am too. It doesn’t exist. 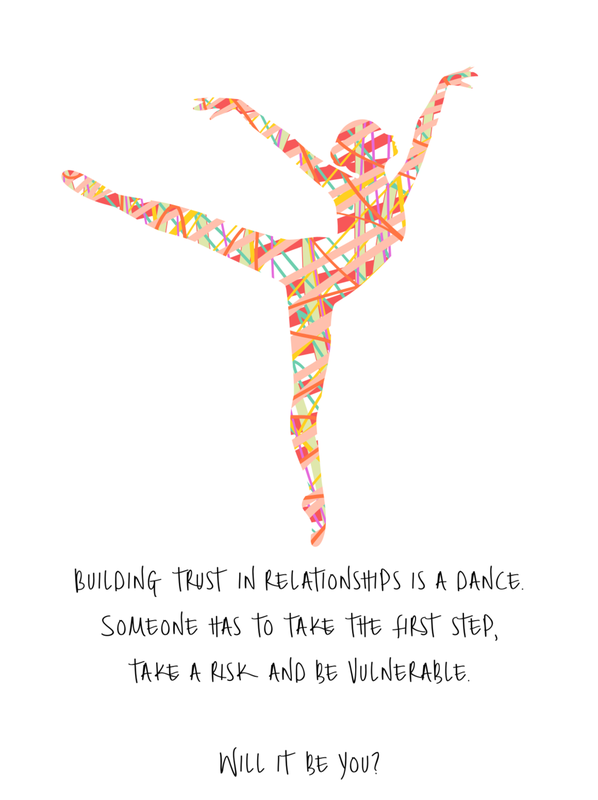 Building trust in a relationship or in a group is a dance. At the conclusion of our discussion the best we could do was to suggest that a trusting behavior is going to be the first step in that relationship. Someone needs to take the risk and be vulnerable first. Will that be you?